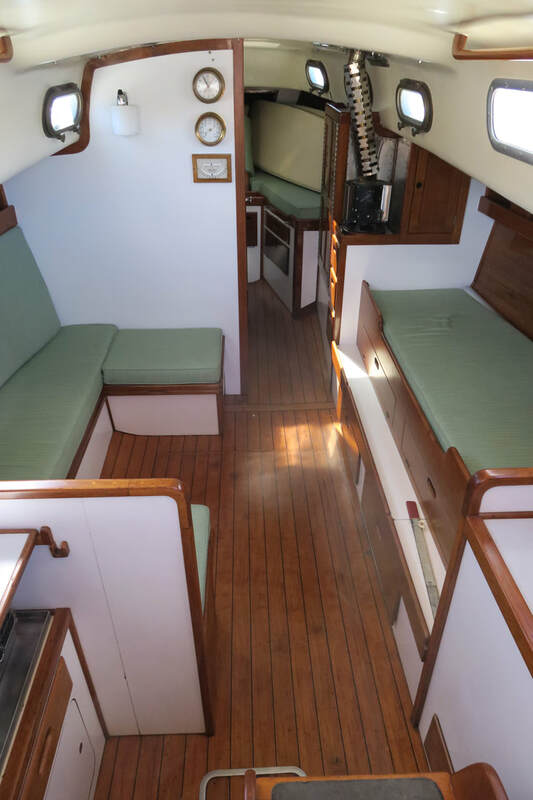 CROW is a Luders 33 (Hull #10) who is now "managing" her fourth owner since being built by the Allied Boat Company of Catskill, NY in 1966. Allied is no longer in business. Through this page I'll attempt to document some of the upgrades I will make over my ownership, which began in the Fall of 2017. Cleaning and varnish, except when "unordinary," will be exempt from detailed comment :). Despite the fact that she has been well cared for by her last owner (since 2010) and major work accomplished such as: toerail replacement; bottom barrier coat; navigation instrument upgrades; as well as sail & canvas replacement, other things still need to be addressed on this 51 year old beauty! CROW has a tiller - not a wheel. Her 1st owner sold CROW in 1976 to her 2nd who had the boat for 34 years, until he sold her to the 3rd in 2010. She had been across the Atlantic to Scotland, up to Newfoundland and to the Caribbean for both owner pleasure and charter,. She spent most of her 51 years homeported in Maine as a private use and chartered vessel. No charter took place under her 3rd owner, nor will there be under her 4th! One of the risks one takes in chartering (private use as well) is as depicted in the photo below from the pre-1995 event. My observation and response was in the subsequent December issue of Points East. CROW is none the worse for that event by the way and the use of CORVUS as a name was an attempt to disguise the boat it would seem - without much luck. You can see the full story on Page 42 by linking to online article, the archive (with both photos), or download the PDF below. Archived Points East are also available on their site and my "Response" is in the December Issue - not yet posted. a. Everything from floor and wall painting to complete removal of holding tank, head and all hoses.... to be replaced with a Composting Toilet (Airhead). a. Shift to "Spartan" deck chainplates (bronze) with under deck backing "plates." 3. Paint Boom, Spreaders & Mast fixing any defects along the way. 4. 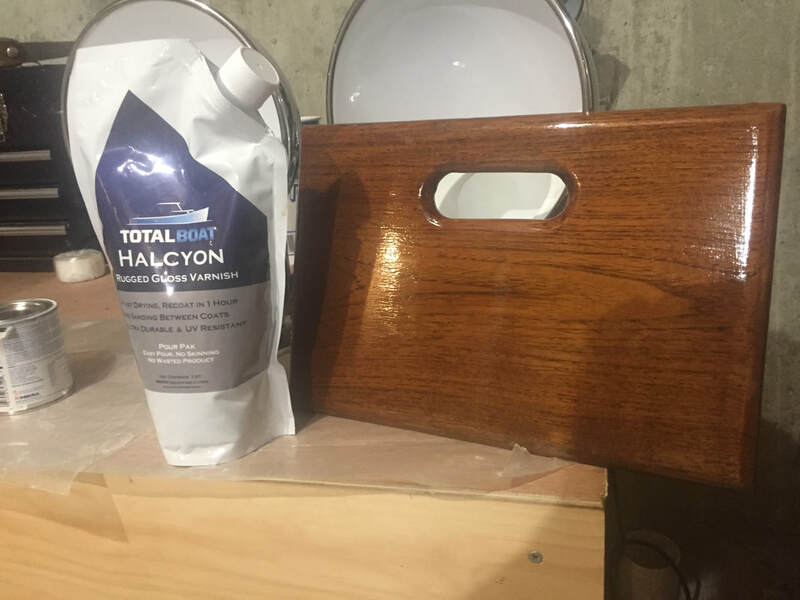 Paint all cabin horizontal surfaces (bunk & shelf) and removing any drawer liner paper used previously on those surfaces. 5. Paint all locker areas, none of which have had surface treatment in 51 years. 6. Address Yanmar starting issues (lugging) that are probably as a result of being operated at 2000rpm or below for it's 750 hr (22 year) life. Yep - that's my bet :(. Abuse of a diesel. 7. Replacing exterior and interior lights with LED lights - starting with 35W Spreader Lights! 9. Anchor - Replace CQR with ROCHNA! CQR is now a lawn ornament :). This was actually the First thing I did. ​More detail via the button below - when I post it. She looks great - but there are always projects on a 51 year old boat. ​My "new" Varnish (which is in Test by me). One (1) coat every hour and I can easily do eight (8) or so a day! Done that and VERY happy so far. Interior first and then we'll see about the exterior. The OLD and the NEW - (Some images should be rotated to the right 90 deg.